Ingvar Kamprad is the founder of Swedish retail company IKEA. There are over 300 IKEA stores in the world, spread out over 35+ countries. IKEA is privately held. Throughout it’s history, IKEA has never been a traded stock company. IKEA’s elaborate ownership structure makes it very difficult to establish exactly how rich Ingvar Kamprad is and how large a quantity of assets he is actually in control of. The ownership structure does for instance include several off-shore trust funds that aren’t own by Kamprad himself, but that are ultimately under his control. Ingvar Kamprad chairs the Stichting INKGA Foundation; one of the largest charitable foundations in the world. The Dutch-registered Stichting INKGA Foundation owns INGKA Holding, which is the parent company for all IKEA stores. It is a complex tax sheltering network that makes Kamprad’s actual degree of control vague. In 2010, Forbes placed Kamprad as #11 on their list of the world’s richest persons, with an estimated 23 billion USD fortune. A year later, he was found down in spot #162 after his lawyers had produced documents stating that IKEA is owned by a foundation and that the foundation’s bylaws bars Ingvar Kamprad and his family from benefiting from its funds. Despite this, Bloomberg put Ingvar Kamprad on spot #8 in their Bloomberg Billionaires Index for the year 2015, with an estimated net worth of well over 43 billion USD. The original stated purpose of the Stichting INKGA Foundation was to “promote and support innovation in the field of architectural and interior design“, but this was later expanded to also include aiding children in the developing world. The change was made after the foundation came under fire for making such small donations to charitable causes in relation to its huge endowment. Despite being a charitable foundation, the primary purpose of the Stichting INKGA Foundation is widely regarded to be corporate tax-minimisation and anti-takeover protection for IKEA. Kamprad has also stated that he wants it to be impossible for his heirs to break up the company. The Stichting INGKA Foundation is the world’s second wealthiest charity, after The Bill and Melinda Gates Foundation. In June 2013, Ingvar Kamprad resigned from the board of Inter IKEA Holding SA at an age of 87 and his youngest son Mathias Kamprad replaced Per Ludvigsson as chairman of the company. Ingvar Kamprad also announced that he intended to move back to Sweden. Since March 2014, Ingvar Kamprad has been living near his birthplace in Småland, Sweden. Kamprad’s two other sons also have major leadership roles at IKEA, while his daughter isn’t involved in the businesses. .
– IKEA stores often attracts customers from far away. Sometimes even from other countries. It is common for Russians to go to Finland to visit IKEA (Unless they live close to Moscow or another city with an IKEA). – Norwegians often drive to Sweden when they want to shop at IKEA since the prices are lower in Swedish IKEA stores. Some even get forbrukslan (a type of personal loans) before they go to be able to buy a lot of furniture and bring back home. – There are no IKEA stores in South or Central America. Ingvar Feodor Kamprad was born on 30 March 1926 in the county of Pjätteryd in south-eastern Sweden, where he grew up on a family farm named Elmtaryd (also spelled Älmtaryd). The closest village was Agunnaryd, in the Ljungby Municipality. Ingvar Kamprad’s paternal grandfather was a German immigrant, hence the name surname Kamprad. At the age of six, Ingvar Kamprad began making tiny profits selling matches to his neighbors. He purchased matches in bulk from Stockholm and sold them individually to his neighbors. Just a few years later, he used his bicycle to traverse the countryside selling fish, Christmas decorations and seeds, and eventually also ballpoint pens and pencils. IKEA was founded in 1943 at Ingvar’s uncle Ernst’s kitchen table. The 17 year old Ingvar had been rewarded with a small lump of cash from his father for doing well in school despite struggling with dyslexia. Kamprad used this cash to found the business he named IKEA. The name is derived from Ingvar – Kamprad – Elmtaryd – Agunnaryd. Two years after founding IKEA, Kamprad began using local milk trucks to deliver goods to his customers, and he soon added furniture made by locals to his product range. The locally made, and very inexpensive, furniture became such a hit that manufacturers began boycotting IKEA, forcing Kamprad to keep the design of his products in-house. One day, Kamprad needed to transport a table in his car but was struggling to fit it into the boot. A friend suggested he should take the table legs off – and this gave Kamprad the idea of flat-packed furniture. For many years, IKEA was chiefly a mail-order business, but in 1953 Kamprad opened a brick-and-mortar store in Älmhult. Five years later, a larger warehouse was erected next to the original store and this was to serve as a model for IKEA:s future expansion throughout Sweden and Europe. IKEA:s second warehouse was opened in Asker outside Oslo in 1963. The world’s third IKEA warehouse was built south of Stockholm in 1965. It was a large and rounded building, it’s shape inspired by the Guggenheim museum in New York City. At this time, a name struggle was taking place within the IKEA company, causing the store to have an IKEA sign at its southern entrance and a sign displaying the name Möbel-IKEA (Furniture-IKEA) at its northern entrance. One of these signs suffered from an electrical problem that would eventually cause a highly destructive fire on 5 September 1970. When the store was rebuilt after the fire, it contained a restaurant and self-serve area for flat-pack pick-up – two features that have remained with IKEA ever since. Ingvar Kamprad and Kerstin Wadling married in 1950 and divorced in 1960. The same year as the divorce, Kamprad married 20-year-old Margaretha Stennert. The couple stayed together until her death in 2011. Together with his first wife Kerstin Wadling, Ingvar Kamprad adopted a 3-month-old girl named Annika in 1958. (Annika Kihlbom, née Kamprad.) After the couple’s divorce in 1960, Annika lived with Kerstin. Annika Kihlbom is not involved in the running of IKEA. She lives on a horse farm in Bålsta, Sweden and runs two small companies: Ateljé Vävsömmen och Kihlbloms Gourmand AB. Together with his second wife Margaretha Stennert, Kamprad has the sons Peter Kamprad, Jonas Kamprad and Matthias Kamprad. 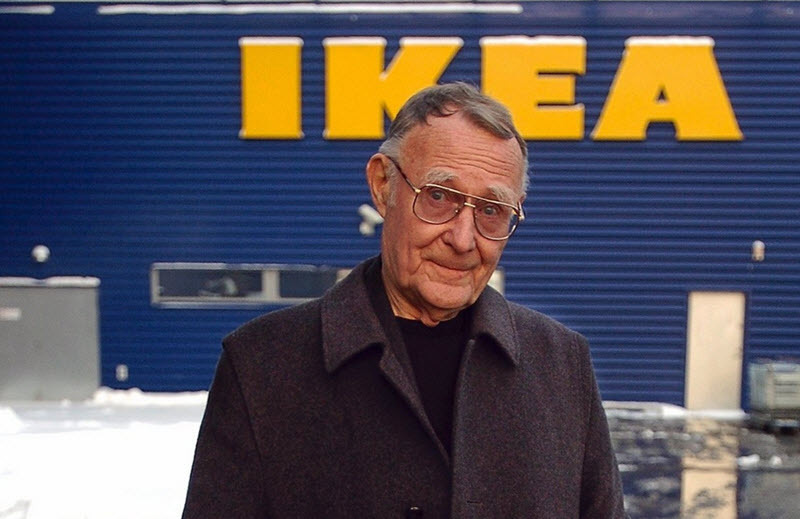 Ingvar Kamprad has arranged for them to take over the running of IKEA after him, within the limits imposed by the foundation bylaws. All three are already working in management roles within IKEA. – He flies economy class and is fond of low-price airlines. – He sits in second-class train cars. – In 1976 – 2014 he lived in Épalinges, in a house that was nice but by no means over-the-top luxurious. – He pockets the salt and pepper packets at restaurants. – He visits IKEA to eat a “cheap meal” in the IKEA restaurant. – He buys Christmas presents and Christmas paper at the post-Christmas sales. This doesn’t mean that he lives like a pauper. He does for instance own exclusive real estate in several countries, including a large country estate in Sweden and a vineyard in Provence, France.